History may be made in a variety of ways. But when Oregon’s only two female governors join forces, it’s bound to be memorable. Former governor Barbara Roberts, who held the seat from 1991 – 1995, will join current Governor Kate Brown in leading the 2015 Portland Rose Festival’s Grand Floral Parade. The two politicians have been named grand marshals and will march at the forefront of the parade, scheduled for 10 a.m. on June 6. According to the event website, committee members chose the grand marshals to “salute the leadership and statesmanship of these two women, who have helped make Oregon such a great state to live in and visit.” The accomplishments and contributions of Roberts and Brown are indeed extensive. Kate Brown gained the office in February after serving as Secretary of State, a result of former governor John Kitzhaber’s resignation. Upon being sworn in, Brown promised to work toward restoring unity and public trust in the governmental system. Brown’s prior accomplishments include becoming the first woman to serve as Oregon senate majority leader and updating the state’s campaign finance reporting system. Two decades before, Barbara Roberts had charted unknown political territory, serving as the state’s very first female governor. Facing political and societal stigmas, Roberts worked hard to pursue goals of improved public education and the protection of human rights. Roberts’s governorship is also remembered for its focus on tax reforms and environmental interests. In 2011, she published a memoir chronicling her unlikely rise to power, titled Up the Capitol Steps. OSU Press is proud to announce that the Rose Festival Association provided a copy of the memoir to each princess on the 2015 Rose Court. How does one define “better”? It’s a question redolent of philosophy, but one that applies to nearly every aspect of our lives. In her forthcoming book, Building a Better Nest, Evelyn Searle Hess tackles this all-encompassing question. Hess joins us today to discuss the very essence of her work and share what we as a global community may do to live fulfilled, harmonious lives. As the story unfolds of building our first house in over a decade and a half, Building a Better Nest asks the question, “What is ‘better’ not just for the individual or family, but also for the ecosystem, the community and the world?” Unfortunately, the road is long and bumpy between defining “better” and being able to do anything about it. First we must acknowledge the extent of the mess our species has made of our planet: disappearing species, polluted air and water, widening income gap, climate craziness, acidification of rising seas, blown-up mountains, destroyed ecosystems and more. Then we come face to face with myriad roadblocks to rerouting that relentless march to annihilation: our economic system that favors growth, progress and the bottom line over all things natural; our society’s acceptance of acquisition as a symbol of success and of convenience and comfort as necessities for happiness; the continuing divorce of humanity from the natural world, and the innate human fear of change. How do we build a better nest in the face of an economy, social goals and our own lizard brains all hell-bent for destruction of that very nest? Neuroscience shows that people’s happiness conflates with their expectations. Corporate advertisers exploit this fact regularly, directing our expectations toward more, newer and fancier. But we can choose to define our own goals in self- and nature-affirming ways, rather than letting the P.R. folks be the designers of our dreams. If we can imagine a better world, we can make it so. Rather than profit for the CEO and shareholders, the bottom line we strive for could be happiness for the 99% and healthy ecosystems. We could learn to look forward to a productive backyard garden rather than a second car, to cooperative ventures rather than exploitive ones, to the rewards of doing work we love rather than working for status. If we accept the challenge of living our own best lives, we will find concert in a community where almost everyone yearns for more authenticity and meaning. That community can stretch beyond a clutch of friends to the neighborhood and distant reaches until it finds the strength to influence legislation and inspire the production of sustainable technologies. And that community may recognize itself as part of a bioregion that includes air, water and soil required for life, along with all of the other creatures sharing that air, water and soil, from the most miniscule to the immense, from the floating and the swimming, the wriggling and the creeping, the galloping and the flying, to the sprouting and flowering and leafing and towering. And we will then know that saving the individual requires saving each other and our life-giving biosphere. This is not a pipe dream. Like building a house from its foundation, all-important movements for change begin from the bottom—with people committed to a vision and brave enough to defy the accepted norm. The damage already done to this planet is such that major change is already on its way, but if we choose now to live as responsibly as possible--simply, attentively, cooperatively and empathetically--we can not only mitigate the damage, we can learn and teach our children how to live more rewarding and harmonious lives. As Building a Better Nest tracks the building of the house and plumbs ancestral memories, it seeks to understand the myriad connections essential to all species and the societal and personal strictures that limit our ability to honor and conserve those connections. The book will do its job if it provokes conversation. May we grab the controls of our careening ship to give this blue planet and our children a fighting chance. Evelyn Searle Hess is the author of two books published by OSU Press, including the forthcoming Building a Better Nest: Living Lightly at Home and in the World. Having worn a variety of hats in her lifetime—including teacher, gardener, nursery owner, and garden designer—she now lives along southern Oregon’s Coast Range, weeding, writing, and trying to put up her garden produce before the critters get it. Her 2010 book, To the Woods, earned a WILLA Literary Award for Best Creative Nonfiction. Some books must be read more than once. Some books appeal to multiple generations. And some books fit into both categories. Historian Richard W. Etulain joins us today to discuss the powerful prose of one of Oregon’s greatest literary legacies. Ask an Oregonian to identify the only novelist from the state to win a Pulitzer Prize. The frequent—and wrong—answers are Ken Kesey, Ursula LeGuin, or, for the younger set, Chuck Palahniuk. The correct response: H. L. Davis’s Honey in the Horn (1935), which snagged a coveted Pulitzer in 1936. It also won the Harper Prize for 1935. I learned of Davis and his nationally recognized novel when I was in graduate school at the University of Oregon in the early 1960s. Davis had died in 1960, but among Oregon’s literary cognoscenti he was still remembered. Harold Lenoir Davis broke free from the numbing traditions of previous writers in the Pacific Northwest. He avoided the romance genre Frederic Homer Balch utilized in his long-popular Bridge of the Gods (1890) and kept his distance from the formula-ridden Westerns of Zane Grey and Max Brand. Instead, as I came to realize, Davis had, by diligent work, become a superb regional writer. He did for the Pacific Northwest what William Faulkner did for the South, John Steinbeck for California. Most of all, regional writers like Davis showed how regions or places shaped diverse characters. Status Rerum prepared the way for Honey in the Horn. Davis would then go his own stubborn way, avoiding the romance and the Western and turning out fiction rich in regional settings, local speech patterns, and individualistic character types. When I dipped into Honey in the Horn, Davis’s first novel, I was immediately drawn to the familiar “growing up” theme at the center of his novel. Two youthful wanderers without strong, experienced moorings, Clay and Luce, drift through Davis’s marvelously described landscapes—from the Oregon Coast, to the Willamette Valley, and on to the High Deserts. Some readers exult over Davis’s vivid landscapes. They should. But I am even more intrigued by his wry, pungent characterizations of a whole gamut of regional character types. His character vignettes depict a spectrum of pioneer figures that Oregon’s previous—and many later—writers have overlooked. More than a few of Davis’s characters seem like vagabonds searching, often unsuccessfully, for Oregon places in which to root themselves. Understandably, Davis’s unvarnished treatment of Oregon and its early settlers alienated the state’s cultural chauvinists. Unbowed, Davis moved on to write a clutch of strong novels, short stories, and essays about the Oregon Country. All overflowed with a redolent regionalism, demonstrating how a talented author could exhibit the molding power of physical and cultural environments on a collage of colorful characters. The Oregon State University Press does a meritorious service in reprinting Davis’s path-breaking novel. The reappearance of Honey in the Horn will introduce a new generation to an Oregon literary classic, the first novel in the Pacific Northwest to gain national prominence. Davis’s premier work of fiction richly merits a fresh wave of appreciative attention. Originally published in 1935, Honey in the Horn once more hits the press this June to reach a new generation of readers. Lauded even in Davis’s lifetime, the book captures Oregon spirit and history in a nearly tangible way that hasn’t been seen since. Commemorate Davis and his legacy Wednesday, June 10, at a celebration sponsored by the Umpqua Valley Arts Association and While Away Books. Including readings from authors like Robert Heilman and Karen Tolley, the event will begin at 7:00 p.m. at the Umpqua Valley Arts Association Art Center in Roseburg. Discover the raw beauty of Honey in the Horn for yourself here, updated with an introduction by Richard W. Etulain. H. L. Davis (1894 – 1960) was an Oregon novelist and poet whose work emphasized the beauty of place and landscape. Davis created gritty, realistic characters whose lives were far from perfect, overturning the popularized romanticism of the West. His 1935 novel, Honey in the Horn, earned him a Pulitzer Prize, making him the only Oregonian to have ever earned the honor. Richard W. Etulain is the author or editor of more than fifty books, including Conversations with Wallace Stegner on Western History and Literature, Beyond the Missouri: The Story of the American West, and Lincoln and Oregon Country Politics in the Civil War Era. A Professor Emeritus of History at the University of New Mexico, he lives in Clackamas, Oregon. Life, liberty, and the pursuit of happiness: words that promise the potential of personal agency and bliss. It’s human nature to search for the fulfillment of such a promise, yet individuals chase after it in a multitude of ways. 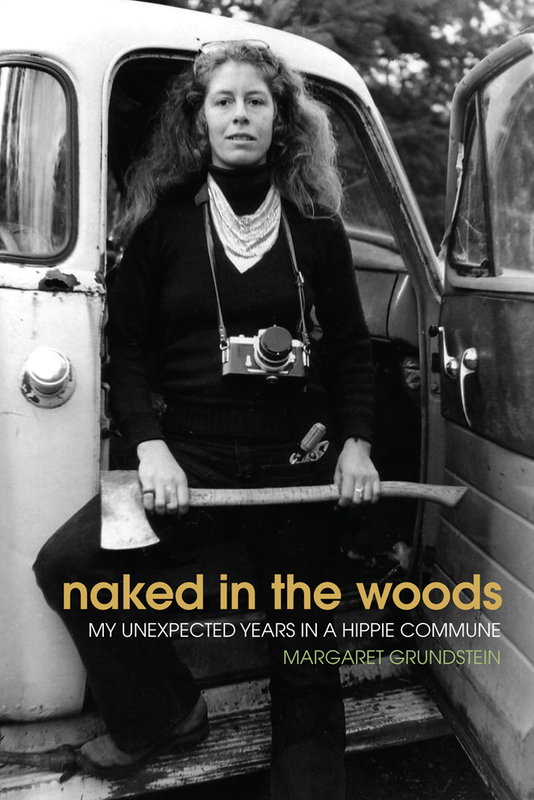 Author Margaret Grundstein visits us today to talk about her own search for happiness, chronicled in recently-released Naked in the Woods. “Who comes with me wherever I go?” I ask, sitting cross-legged on the floor, my right hand tucked in my lap, my left discreetly tapping two little boots that I have cut from black construction paper to the inside of my wrist. It is raining outside. In front of me, ten toddlers sit nestled against the comforting chests of their parents. I wait a beat. After all, this is Los Angeles and timing is everything. They know what’s coming. We do this every week. I pause, and up he pops, my thumb and fingers poised at the end of my arm. “Those are beautiful new boots, Mr. Hand,” I say. He lowers his head at my wrist, striking a modest angle. “Yes,” he says, nodding slowly. I take in the trusting faces that are my audience, each one a delicious dumpling. Their lips are parted as they watch with clear eyes, not caring if my voice and Mr. Hand’s mouth are out of synch. Gradually Mr. Hand lifts his head, feeling safe among familiar faces, and with my help shares his excitement over his new rainwear. Then he moves on to his real job, picking the child whose name will open our ritual welcoming song. This is my utopia. Walk through the gate to the preschool I founded in Venice, California, and the world drops away. Friendly is the operative word and love is my currency. I need this. Forty years ago I sought another kind of utopia. Back in 1969, I was part of a group of radicals at Yale trying to create a world where we could live in innocence. It had seemed possible. San Francisco celebrated the summer of love, Martin Luther King taught us the power of nonviolence, and Woodstock was iconic before Max Yeager’s fields had even dried. Then armored tanks rolled across the campus. We had hoped for peace, ignoring the consequences of our growing militancy as students occupied campus buildings and organized strikes, demanding an end to the war in Vietnam and racism at home. Nationally, the civil rights movement shifted with the arrival of thirty Black Panthers in paramilitary berets and leather jackets at the California State Assembly, flaunting rifles and shotguns to protest arms-control legislation. The country, watching on television, shuddered and looked to the locks on their doors and windows. Cities burned, assassins murdered Malcolm X and MLK, and the National Guard, dressed like invading aliens in gas masks and goggles, killed four students at Kent State and injured nine. This was revolution. Swaying together, singing “we shall overcome” was no longer enough. The tanks lumbering through my neighborhood, clanking down my street, brought home the futility of confrontational tactics. We needed a new plan, one that was plausible and released us from the politics of mutual hate. If we couldn’t change the world we would change ourselves, building communities, where, as the Beatles told us, “all we need is love.” In Vermont, New Mexico, Virginia, and Oregon--any place where land was available and people sparse--students dropped out, looking for a more peaceful solution. 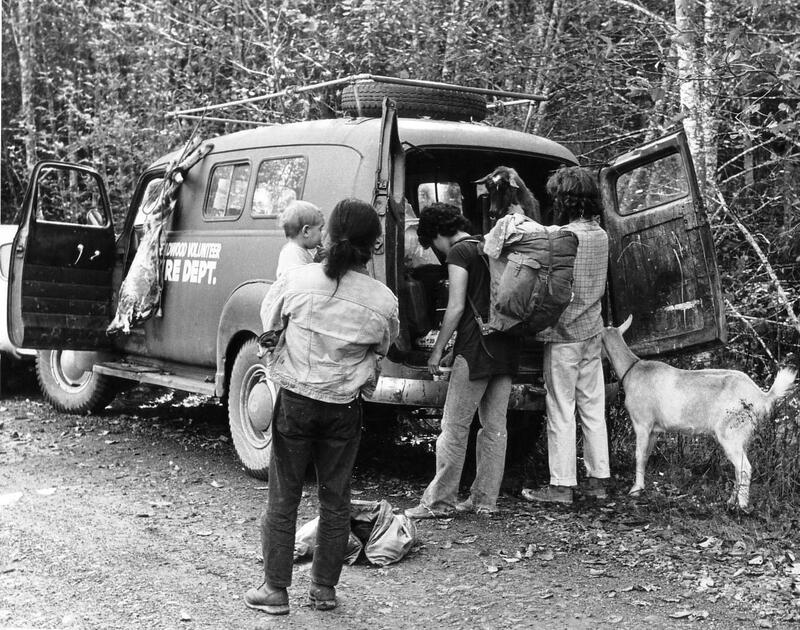 The back-to-the-land movement showed us a way we could love ourselves, each other, and the dirt that fed us. We wanted to be stardust. We wanted to be golden. Naked in the Woods is the story of that quest, told through my experience. But like any utopia, even the one I presently enjoy, we cannot, as Joni Mitchell sang in her iconic song Woodstock, escape the devil's bargain. Returning back to the garden may be impossible; trying is not, because, as she reminds us … life is for learning. Margaret Grundstein, in addition to directing the preschool in Venice, California, practices photography and owns a private practice of psychotherapy. She has a B.A. from Goddard College, a Masters in Urban Planning from Yale University, and a Masters in Family Therapy from Loyola Marymount. Naked in the Woods is her first book. Included photos courtesy of Margaret Grundstein.